I’ve taken the scenic route through, well, just about everything in my life! I was married for about 5 minutes in my 20’s (his folks lived in a castle in Portugal, what was a girl to do!) that gave me two beautiful children and a lifelong friend. His wife of almost 30 years is also a very good friend of mine. I remarried in my early 30’s to a man I was crazy about. He would describe our meeting as the “Thunderbolt!” referencing Michael Corleone meeting his Italian wife in Italy. Paul was also single with two daughters. We combined our families in July 1988. My young son, daughter and I moved to Greenwich, Connecticut and began a wonderful life filled with big family and friends’ celebrations, skiing each weekend in Vermont and enjoying the summers poolside. Paul and I had two boys together, “Paulie Boy” and Jack. I clearly remember feeling that life couldn’t get any better than this: I was content with my part time career as a kitchen designer, was involved in my church, happily married and loved having 6 kids!! I was killing it as the modern-day Donna Reed! Mary with children and grandkids. On June 12, 1993 all of that changed when my gorgeous, meatball of a 3 ½ year-old son, Paulie Boy, passed away after drowning in our back-yard pool. Paul and I were at a Greenwich waterfront concert with a large group of friends that had just been to our house for a pre-concert party. Paulie was home with a babysitter. Apparently, he went into the back to get a toy and somehow ended up in the pool. Paulie was a good swimmer. The doctor said there was a major head injury, but we will never know if he fell and hit his head then rolled into the pool or hit his head as he fell into the pool. We got to Greenwich Hospital before the ambulance did. Paulie was still alive when he arrived at the hospital, but they couldn’t save him. 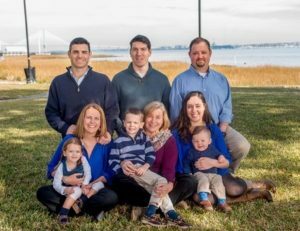 Our family suffered, but no one suffered more than Paul. The essence of the man I was married to, the man I was so in love with also died that night. The next few years were painful beyond words. There is simply no vocabulary to describe the loss of a child. It’s incomprehensible that you could be in so much pain and not die yourself. I had seen my parents go through so much while all along getting closer and closer. So, naturally, I assumed this would be our story as well. It should have made us closer, but it didn’t. Paul’s anger with the world, God, and all else spilled over on to all of us. After four years filed with endless tears, grief counseling, couples’ counseling, near bankruptcy, and on the advice of my priest and my Irish grandmother in Brooklyn, I divorced Paul. I had Joseph and Catherine in middle school and Jack, who was 4 years old. More urgently, I was broke. My family and friends assumed I would go back to Long Island. I chose to stay in Greenwich so Jack would still be near his father. Plus, we had lived in Greenwich for almost 10 years by then and didn’t want to rip Joe and Catherine from their friends. I needed a time out. The next 10 years were spent working two jobs and taking time with my kids. I thought if I made my decisions based on what was best for them, it would all be ok. We all needed to heal. First, I needed to be ok for the children’s sake. I needed to live life to fullest, to embrace even the smallest of pleasures to show them it is ok to be happy. I encouraged them to take risks and to give all they had to whatever they were pursuing. Joe and Catherine excelled in sports and being their cheerleader became my social life. I have always had lots of good friends. I did date, but no one that captured my heart. There were so many false starts to a newly created fulfilled life. I did write a one woman show, “…a little bit of Mar!…”, and performed at the Starlight Theater in the South Street Seaport. My God, that was fun! I also had the chance to sing back up for Deep Purple at the Jones Beach Theatre. 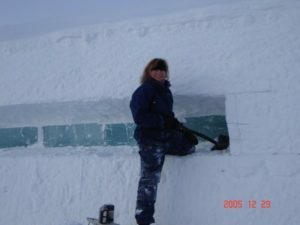 First year working at ICEHOTEL. 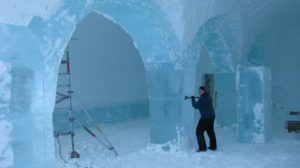 One night in early 2005 I was watching the Discovery channel and came upon a documentary on the ICEHOTEL, a hotel constructed entirely out of ice and snow in northern Sweden. Somehow, this brought me to tears. I attended college in Buffalo, NY and survived the year it snowed so much the army had to come and dig us out. I also spent a lot of time in Lake Placid. I love the snow. When my kids came into the room and saw how inspired I was with ICEHOTEL, exclaiming “I have to go there,” they challenged me to “make it happen!” At this point Joe had graduated from Ohio Wesleyan and was home working. Jack was about to enter 8th grade. The following summer I decided to go for it. I called Arne Bergh, the Creative Director, and asked if I could come and help build the ICEHOTEL. I had a good job as a kitchen and bath designer and knew I could take a leave of absence while not losing my insurance or 401K. I would be in Jukkasjarvi, Sweden from November 6, 2005 to the beginning of February 2006. I was able to work it out so that Joe, his girlfriend (now wife) Sarah and Jack would come over Christmas Eve, then Jack would stay with me until February. Somehow, I convinced Paul and the Greenwich School System that Jack would take classes, be immersed into the Arctic lifestyle, and truly benefit from this respite. What an amazing time this was. I flew to Stockholm, then up to Kiruna approximately 160 miles north of the Arctic Circle not knowing a soul, not speaking the language. I was 51 years old working on a building team made up of mostly kids in their 20’s and 30’s. This was a blank canvas for me. No one knew of my losses, no one asked with lingering sympathy “How are you?” My value was my work ethic, and sense of humor. We worked in negative 45-degree weather, loading wheel barrows with snow, moving blocks of ice, all in the dark. Artists came from around the world to create the individual art suites. That winter, National Geographic came and filmed the construction process for a documentary. Not only am I in it, but my voice is used to narrate part of it. I was in heaven. I have been involved with ICEHOTEL in many capacities for the last 14 years. Builder, designer, teacher, writer. Folks in Greenwich asked me to give presentations about the construction of this crazy ice and snow hotel. I love sharing my love for “All things Arctic” and became a popular lecturer. I had a press trip planned throughout Sweden, Norway and Finland for an article I was writing for the Greenwich Magazine entitled “An Arctic Bucket List”. 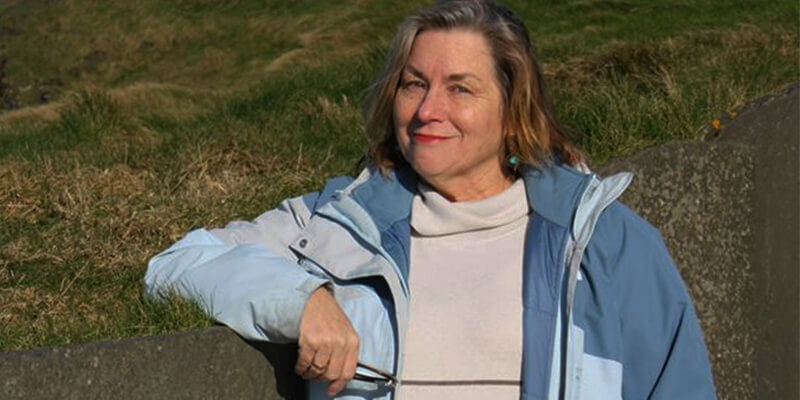 Shortly after the article came out, I presented at the Greenwich Women’s Club. Afterwards, a few women came up to me and asked if I would ever consider leading a tour. Until that moment I had never thought of it. 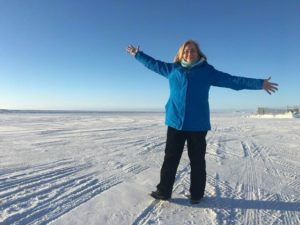 Four years ago, I led my first tour – Ladies Arctic Adventure Bucket List Tour! I love bringing women to my happy place and sharing my friendships and adventures. It’s wonderful to watch someone challenge themselves, to push the envelope and go out of their comfort zone while traveling with me. 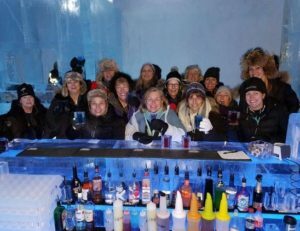 I have had women from 21 to 71 come and explore this magical winter wonderland while dog sledding, reindeer snuggling, snowmobiling, ice sculpting and experiencing the Northern Lights. We are empowered when we succeed at trying new things, seeing new sights, tasting new foods. And, we laugh, exchange stories, encourage each other. Often, I’ll sit back and think about all that’s happened in my 64 years of life. I’ve always been adventurous. Whether I do it purposely or if it’s innate, I only know that I’ve always lived my life this way. I have a strong faith and, although tested, I’ve made a conscious decision not to lose it. Each day, before rising, I identify three things I’m grateful for. It’s rare I don’t do that, even on the worst of days. I purposely live in gratitude. I never let the circumstances of my life affect my life.